Boy am I glad I went. 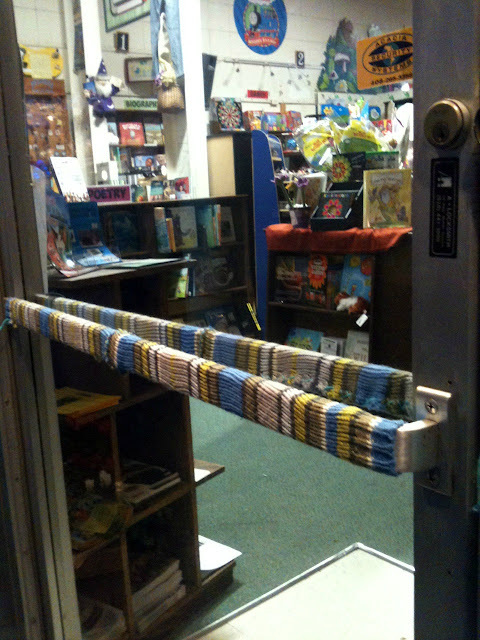 The independent bookstore a few doors down, Hicklebee's, was promoting the children's book Extra Yarn, and apparently decided to yarn bomb their own store. At first I only noticed one window display, but the longer I stood there with a goofy smile on my face, the more yarn I noticed. 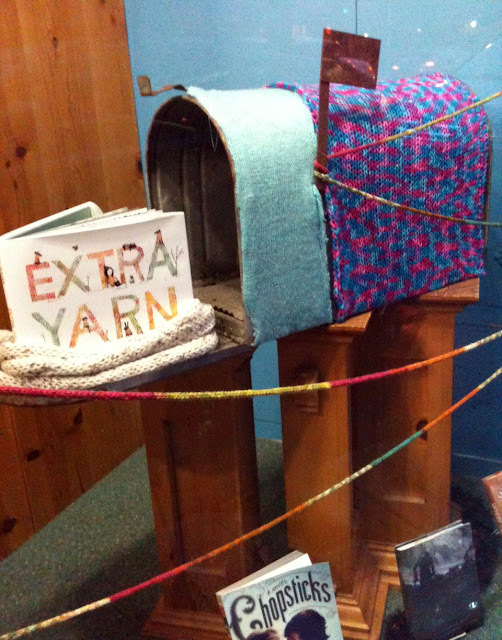 Extra Yarn is the story of a little girl in a dreary world who finds a colorful box of yarn that changes everything when she begins to knit for people, animals, buildings, and trees. 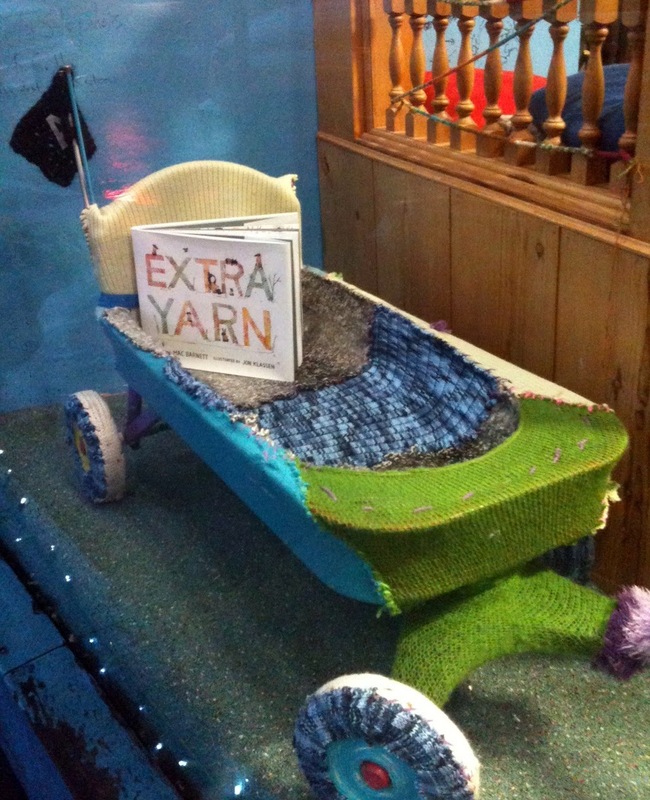 Isn't Extra Yarn just the sweetest little book? Congratulations on your blog feature, that's wonderful. I've never heard of that book, from what you have mentioned about it, it sounds wonderful! I love how far the bookstore went to promote it, so amazing! Also, congrats for the blog feature! You have such a wonderful blog and it certainly deserves a feature! What a neat thing to do with extra yarn:) Congrats on being featured! Go girl! Have a blessed, HUGS! What a cool little bookstore! I've seen Extra Yarn on the internet -- I'm thinking I need to see it in real life! Congrats on your blog feature!!! Congrats on the feature and love the displays. Well done for the bookstore! 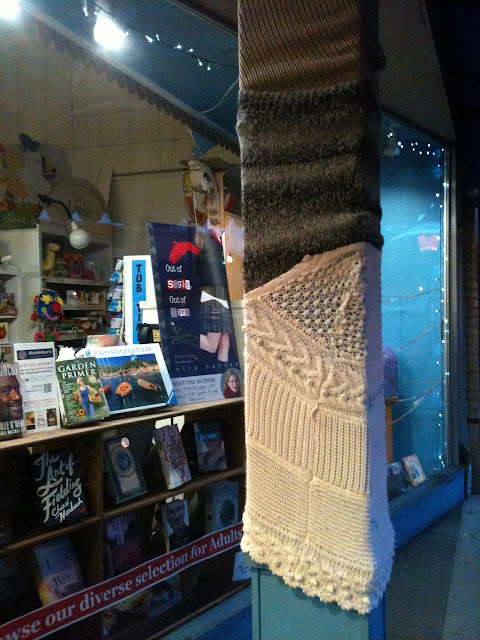 Books + yarn + pizza. Sounds like a great night!! Congrats on being featured! You deserve it! I'm with justjen...books, pizza, and yarn = great night! You are famous! Congratulations! You deserve all the attention. What a riot and pleasant find! Gosh, are there still independent bookstores? We have very few in Cleveland. I will have to check out that book! That sounds like such a cute book, and what a fun store!